Today was the four month check up for the Wombats at the doctor. I'm not sure if they remembered their last appointment but their mother certainly did. She remembered how I went with them to the appointment, they got a bunch of shots, then I headed off to work to leave her with two shrieking infants for the entire night. Jen saw to it that things went a little differently this time. The highlight of the appointment, as with the last one, was the rotovirus vaccine which comes in a tasty sweet gel that they are able to slurp down. Apparently some babies don't care for this but for the Wombats it was the greatest part of their day, and possibly their life. After getting home they slept for hours. We allowed them to sleep in our bed then remembered that we were also really sleepy and wanted to take a nap. Unfortunately we were thwarted by our own stupidity. 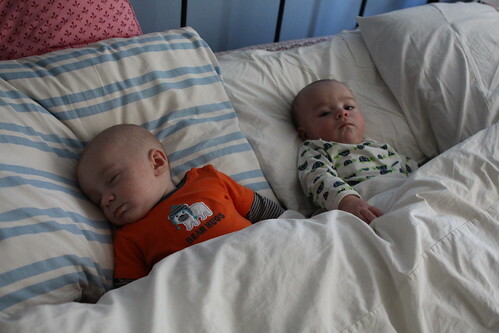 Eventually we divided up the babies and each napped in a separate room. After the nap I seared some short ribs in a pan with carrots, butternut squash, onion, and garlic. 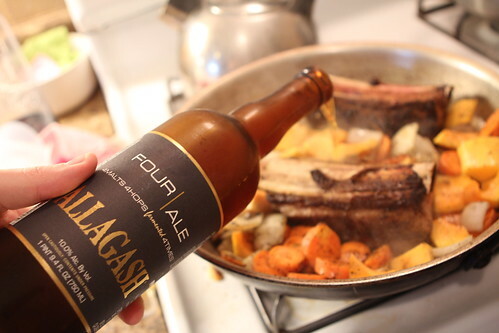 I poured in some leftover Allagash Four Ale and topped it off with beef stock. 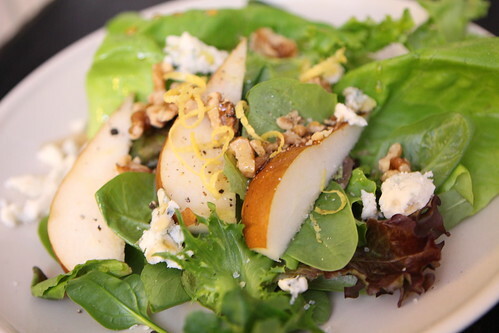 For salad I sliced up some of the farm pears with Boston Bibb lettuce, mixed baby greens, Maytag blue cheese, chopped walnuts, honey, olive oil, and lemon zest. 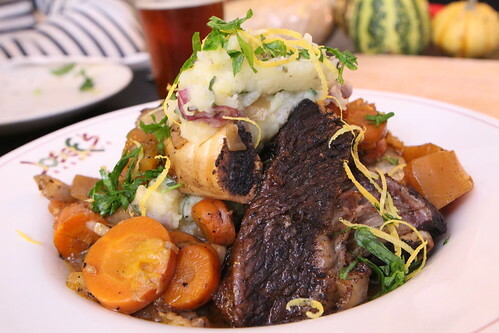 With the short ribs I also served up mashed potatoes with farm sage, lemon zest, and chopped parsley. 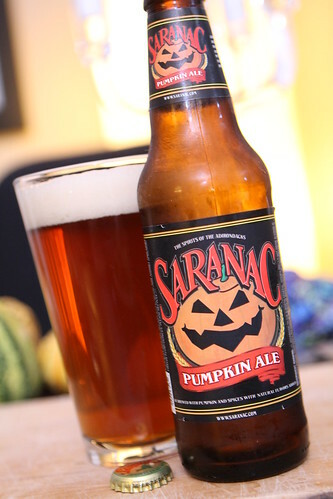 For beer I poured the last of the non-Imperial pumpkin ales, this one from Saranac Brewery. This was among the better of the non-Imperial varieties. Unlike others it did not have an overpowering cinnamon flavor but it did have a very nice, light vanilla finish to it. I hadn't been expecting this one to rank as highly as it did but it was quite enjoyable. After dinner we spent a good hour or so getting the guys to settle down and go to sleep. Then, the greatest injustice of parenthood: the dishes. 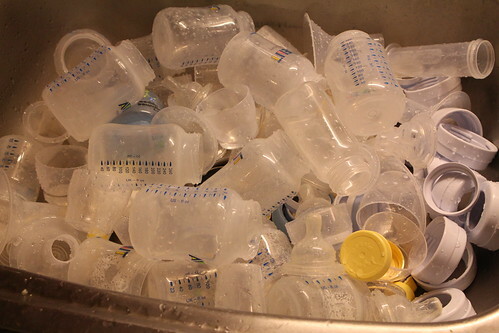 This is just the dishes for the babies. After spending an hour or so this afternoon doing dishes I had to clean an entire sink full of bottles and pumping equipment. All that was before cleaning up our dishes from dinner. I feel that someone, somewhere, should have a website with all the things that idiots like us are too stupid to have imagined before having kids. This would be great just to better prepare dummies like us. It could list a lot of obvious things that new parents don't know. It could warn you that you would be forced to do tremendous amounts of cleaning and preparation for the following when there is nothing you'd rather do but sleep. It could also warn you that you wouldn't have unlimited amounts of time to catch up on television programs and movies while you are feeding the babies.